Hectic week!! and some potato help please. Well as the title says it's been a hectic week so work on the allotment has been scarce and I didn't even get chance to write my Tuesday Tater post or Forecast Friday, let alone keep up with all my favourite blogs do for this I apologies. The 'tasters' post can wait for next week but I will give you a quick weather summary in this post. Well the weather was glorious and I managed to get a little gardening and allotment work done but no where nears as much as I would have liked. Some days though it was just too warm to want to be out in the middle of the day. Weather turned cooler Friday which is just typical as the children have now finished school for Easter break and I have two weeks off work. Not to worry though, I can assure you I will get plenty of work done on the allotment over that period no matter what the weather!! 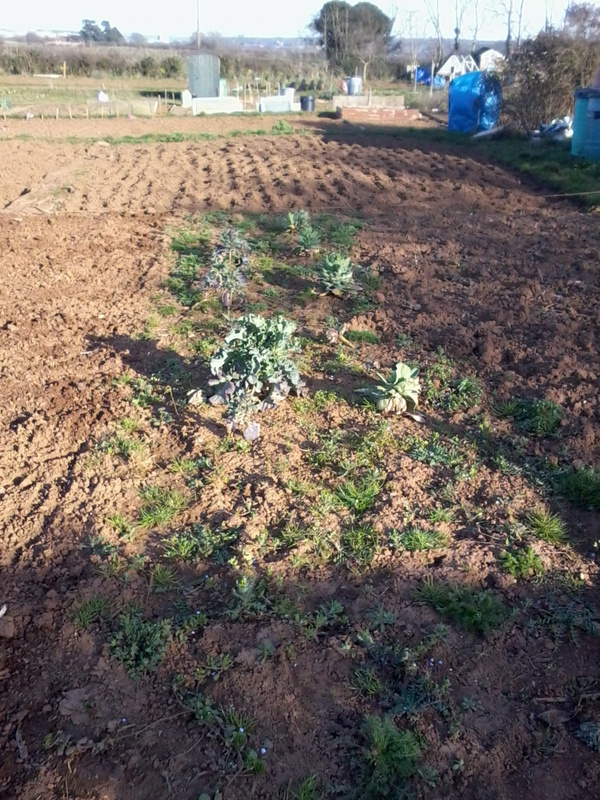 There were a couple of light frosts at night but the temperatures during the day got as high as 18degrees Celsius!! Work carried out on the allotment hasn't been extensive and has mainly been getting sorted and tidied up and one half of the plot is almost complete now so I am very happy with my progress. The sinks are sorted and in place ready for harvesting the vegetables in the future. My final decision for the strawberries was near the raspberry canes. I have bricked this off nicely and then put a centre line of bricks. 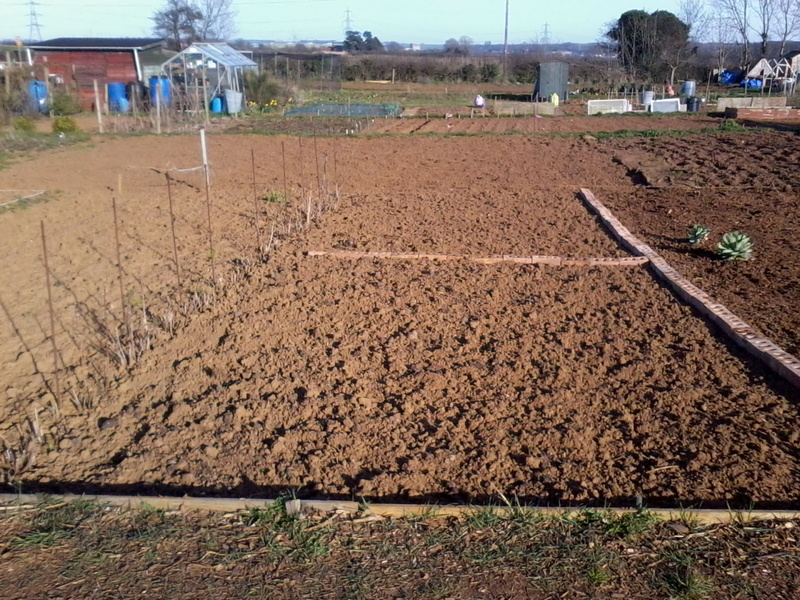 Half of this space will be used for strawberries and then the other half will be used for extra crops up until the pint where the strawberries need moving. 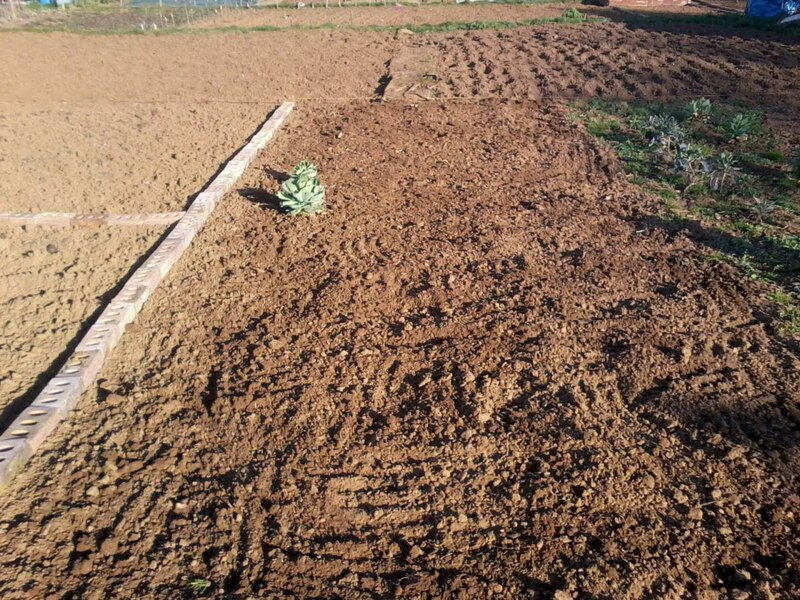 I managed to get some weeding done and then the soil nicely raked over...this hasn't been dug or manured as it is to be this years potato bed and I will dig and manure as I plant. And finally this is the little bit still to be weeded on this side then this one is ready for the planting season. Still need to sort out the new path edging but this is cosmetic and can be slotted in when I have the time. So that's where I'm at for now. I haven't even bought my potatoes yet and I was wondering if you could help me there. I have tried several over the years but have never been truly happy with them once cooked so I wondered if an of you had any you could recommend. I am after a nice either first or second early which boils up well and isn't powdery and doesn't fall apart...so quite a waxy texture really. I would be grateful for any recommendations you have. So far I have tried, Rockets, Charlottes, Maris Peer and another that I can't quite recall the name of though I would know it if I saw it. Well after a terrible start over the weekend of severe heavy rain it has turned into a beautiful week. Sunshine and warmth have kept me happy all week. The temperatures haven't been amazingly high but you have been able to go out in just a t-shirt and jumper although I have seen the odd mad person going round in flip flops and shorts!! Temperatures have ranged between 12 and 14 degrees during the day...warmer if you have been out of the breeze. The weekend outlook is promising and I hope the Met office are true to their word so I can get some serious work done on the allotment in nice sunshine!! Well garlic isn't everyone's cup of tea...it really is one of those 'Marmite' foods. However the problem with garlic is that for those who don't like it they may have to endure it from someone who does as the smell is very strong once eaten...but it doesn't have to be so here's how to make your garlic odourless!! Take your clove (or cloves) of garlic. Cut in half and locate the central growing tip ( I have used one here that has started to sprout so it was easy to see in the photo). Take out the central tip from both sides and 'hey presto! '...odourless garlic!! Now this is quite fiddly so don't expect it to be a quick thing. I haven't tried and tested this method as I don't mind the smell of garlic but I am assured that it does work. If you do decide to give this a go then I would love to know how well it works. Well it's Mothers day for all of those in the United Kingdom today and so I treated my Mum this weekend to a day out at 'The Edible Garden Show'. I don't know if any of you know anything about it but feel free to check out the link. Apparently it has run for a couple of years now but this is the first time I have heard of it. We had a lovely day out albeit very tiring with all the walking around!! Freebies were everywhere so I managed to bag a few seeds and also seeds were on offer at trade prices on a lot of stalls. I picked up quite a bit of information on manures, wormeries composts and such as well as meeting some people from the NSALG. I even bought a few things and really enjoyed the talk by James Wong on growing your own spices and herbs, a couple of which I managed to purchase at the show. A dwarf dessert cherry tree...Stella. I also got myself a sharpening stone and some very good pruners/secateurs. Lots of things were available to be tasted..some which were divine...and some which left me gagging a little. I also found out that I really don't like goats cheese!! Anyway I will be posting about some of the things I found out which I think might be of interest over the coming weeks and I hope you all have a Happy Mothers Day. Well last weekend was glorious with no wind and plenty of bright warm sunshine to really get everyone out in the garden. I could hear the lawn mowers being fired up and the smell of freshly cut grass and wood fires was very welcome to my senses!! The rest of the week hasn't been so great. No rain or wind to speak of but plenty of mist and some thick fog too keeping the sun at bay and the temperatures cooler than the weekend . 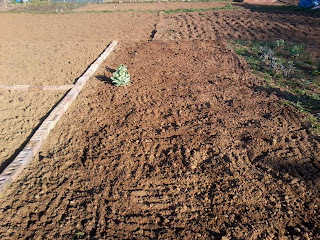 The damp has been good for the gardens as the freshly dug earth has had a nice wetting. No frosts this week though. At the weekend we had day time highs in the mid teens but they haven't got above 10 degrees Celsius throughout the rest of the week. Night-time lows of betweens 8 and 10 degrees Celsius. Here's hoping the weekend weather is a repeat of last weekend!! Is England going 'growing' mad??? I don't know whether it's because I pay more attention now I have an allotment....or if it is just a case of the country realising that growing your own is best...but I keep seeing signs of free seeds and growing veggies EVERYWHERE...here's a few I managed to photograph!! The Daily Mail are giving away tokens to claim up to 15 packets of free seeds...you just have to pay the postage. Birds-eye are giving away free seeds with packets of there veg...and if your signed up to face-book you don't even pay postage on these so providing you buy their veg it really is FREE!! And Morrisons not only have done the 'Lets Grow' vouchers for school for the last few years but also have these wonderful sturdy bags with some great pictures of fruit and veg on which you can buy, this is great as they are very sturdy so protect your shopping well and also are good for the environment as you cut back on carrier bags!! Have you found any great offers that you can let people know about...I'm sure there might be some out there I have missed and would love to take advantage of!! The biggest Failure of 2011!! Well I just thought I would share with you my biggest failure form 2011. It wasn't actually a single crop but several and all of those being my squash plants. Now don't get me wrong I did get fruit off them but no where near the amount that I am used to. I don't think the failure was so much down to the squash itself though but rather down to the 'Hot beds' I thought I would try out last year. Putting the squash into these beds cramped their growing style A LOT and I think this in turn affected the fruit. 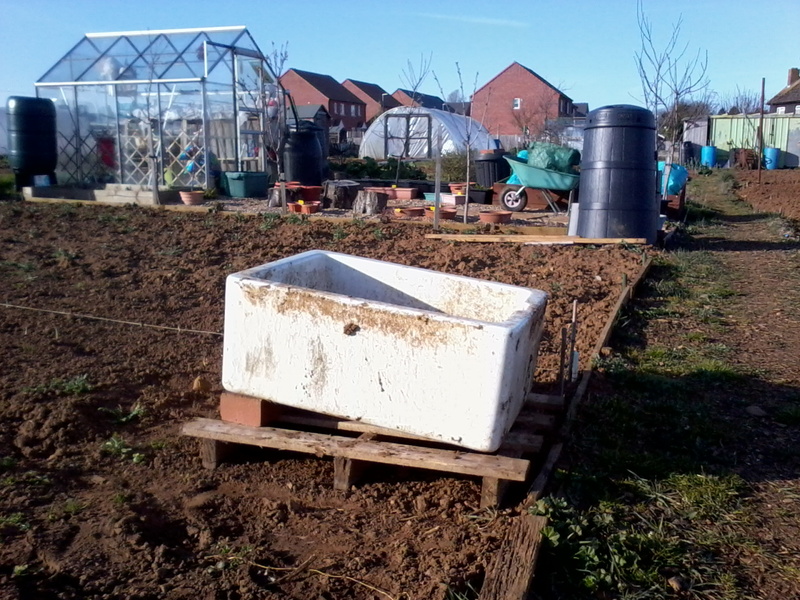 Bottom line, I won't be trying 'Hot beds'...or even raised beds again. The frames will be dismantled and used for much needed repair of the path edge and from now on my squash will have the open areas they have enjoyed so much in the past!! So did you have any major failures in your gardens/allotments last year?? Or maybe try something new that you won't do gain?? We are all garlic and chilli lovers in our house and what better way to have the two combined than to make your own wedges. Making your own is great as you know exactly what has gone in them and it's simple too!! Firstly claen and chop your potatoes into any shape you want and then put them in a bowl of water to remove and excess starch. Whilst the potatoes are in water chop as many chillies and as much garlic as you wish to use, ( I use two hot chillies and a bulb of garlic. Put them in a blender and then whiz for a while. Then add oil, enough to coat your potatoes and whiz again until all nicely blended. Drain the potatoes and add your seasoned oil ...coat well by turning over in the oil, placing on a baking tray in the top of a hot oven until crispy brown, (about 1/2 an hour). And 'voilà! '...tasty home-made wedges, with only things you have added put into them so no nasty surprises!! Of course if you don't like one or both of the ingredients then you can add anything you want...or add a bit of something else to spice them up a bit more. Well I really struggled with a title for this post as I have had such a wonderfully busy weekend!! It has been gloriously sunny and today there was very little breeze and the sun shone in a clear sky all day. In fact it was so warm I even stripped down to a t-shirt and changed the wellington boots for my regular gardening boots as it was so warm. So what have I been up to then?? Well I had a good sort through of my seeds so I could plan what I would be growing this weekend, got the garden all tidied up and got to spend some time down the allotment doing a few tasks too. I can honestly say I am worn out...but it's one of those pleasurable exhaustions full of accomplishments and vitamin D!! So what will I be planting this year??? The Squash....Cucumber (Emilie), Marrow (Long green trailing), Pumpkin (Rocket), Courgette (Astia), Winter Butternut Squash and Gherkin (Diamant). For the Greenhouse....Bell Peppers (Sweet Californian Wonder), Chilli Pepper (Hot Cayenne), and then new for this year to try are Pepino Solanum Muricatum, Golden Berry Little Lanterns and Golden Berry Pineapple. Legumes..... Dwarf Bean (Nomad), Peas (Misty), Mange Tout (Oregan Sugar Pod), Broad beans and Runner Beans. And finally there will be the usual array of salads and herbs grown but I haven't narrowed these down quite yet!! So what did I get accomplished on the allotment then?? Well not really as much as I would have liked!! 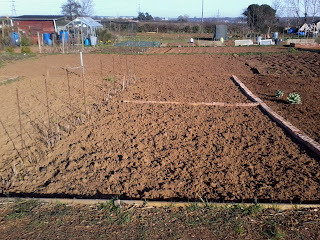 I finally got my garlic and got that planted today and also got some broad beans potted up in the greenhouse. I also put into peat pots, beetroot, celeriac and parsnips. The peppers and Berries for the greenhouse have also been potted up and the leeks sown into a tray, now all I have to do is remember to go down daily and water them. I am hoping to get a few hours throughout the week to get a bit more tidying up done and a few things sorted ready for some serious work next weekend...oh and of course I still have my potatoes and onion sets to talk about!! Hope your weather has been as wonderful as hours and that you have all had a great weekend!! Well the weather has certainly been changeable this week. We have seen daytime temperatures as low as 4 degrees Celsius and as high as 14 degrees Celsius. Evenings have been as low as -2 degrees Celsius and as high as 10 degrees Celsius. We have seen sun, cloud, rain sleet and snow. We have had windy days and calm days and some days where the wind has blown itself in and out on an hourly basis!!! All in all just a little bit weird...but living in the UK you kind of get used to that!! Unfortunately we've had a few computer problems so I didn't get my Tuesday Taster posted this week and I am behind on reading some of my favourite blogs but I hope to get caught up over the weekend and also I hope the weather is a little more settled so I can get some time down the allotment too. Well we're already into March and it's been a lovely week on the weather front. The days have been unseasonably warm reaching into the double figures of between 10 and 15 degrees Celsius during the day and not dropping below 6 degrees Celsius at night. The winds have been mild...nothing above 25 m.p.h. We have had a few light showers but nothing to really soak the ground which meant I got the chance to give my lawns there first cut of the year. The sunrises have often been spectacular though we've had a few over cast days too. Sun is now fully above the horizon by 7am and isn't disappearing until just after 6:15pm. The long-range forecast doesn't give the weather to stay this way but I am hoping they are wrong! !